It is an input component which is used to upload file to the server. It allows us to upload file from the browser to the server. It includes HTML5 features and has nice user interface with progress bar and other useful butttons. PrimeFaces selects the most appropriate uploader engine by detection and it is possible to force one or the other usign an optional configuration param. 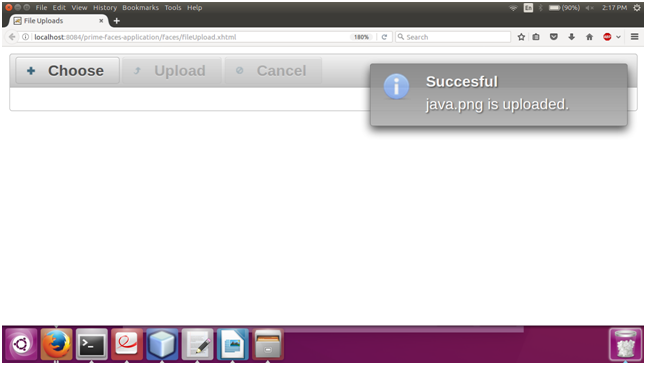 The <p:fileUpload> component is used to create file upload button in JSF application. validator null MethodExpr It is used to set validator for the component. update null String It is used to set update after fileupload completes. process null String It is used to set process in fileupload request. fileUploadListener null MethodExpr A method to invoke when a file is uploaded. multiple false Boolean It allows choosing of multiple file uploads from native file browse dialog. auto false Boolean It is used to set file uploading automatically. label choose String It is a label of the browse button. allowTypes null String It is used to set the allows types for file. sizeLimit null Integer It is used to set file size limit. fileLimit null Integer It is used to set maximum number of files allowed to upload. invalidSizeMessage null String It is used to set message to display when size limit exceeds. fileLimitMessage null String It is used to set message to display when file limit exceeds. accept null String It is used to set filters files in native file browser dialog. sequential false Boolean It is used to allow sequential file uploads. Here, in the following example, we are implementing <p:fileUpload> component. This example contains the following files. Click on the choose button and upload a file. Click on the Upload button and uploading will start. After uploading complete, it displays a message.